Enjoy fun and games along with great dining at Boot Hill Casino & Resort and stay overnight at one of our great partner properties. Rates vary by hotel and are subject to change. Contact hotel for current rate. Restrictions apply. 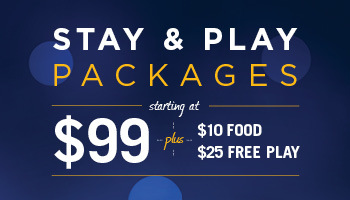 Free Play is valid once per night stay for up to two guests per reservation. Guests must have a Players Club membership to redeem this offer. Players Club memberships are free and available at Boot Hill Casino. See Players Club at Boot Hill Casino for details. All offers and promotions are void and non-redeemable to persons banned from the casino and persons enrolled in the Kansas Voluntary Exclusion program. Adjacent to Boot Hill Casino and the United Wireless Arena, this modern hotel is 3,5 miles from the Boot Hill Museum. Flat screen TVs, coffeemakers and both full and lap desks (for working on the bed) are offered in each room, as well as free Wi-Fi. Suites add kitchenettes and sofa beds. There's an indoor pool and an exercise room in addition to free hot breakfast (or weekday breakfast bags to go). Other amenities include a 24/7 business center and free parking. This extended-stay all-suite hotel is 3.8 miles from Wright Park Zoo and 3.9 miles from Boot Hill Museum. The contemporary studios and suites have flat-screen TVs, desks with ergonomic chairs, and coffeemakers, as well as living areas with pullout sofas, and full kitchens. Some have dining areas. The 1 and 2-bedroom suites have separate living rooms. Wi-Fi is free. Freebies include parking and continental breakfast. There's also a picnic area with a barbecue, and outdoor pool and fitness center. On the outskirts of Dodge City, this unassuming all-suite hotel is 2 miles from Mariah Hills Golf Course and 4 miles from the Boot Hill Museum’s history exhibits. Functional suites come with pullout sofas, free Wi-Fi, flat-screen TVs, as well as microwaves, mini-fridges, tea and coffeemakers. A hot breakfast buffet is complimentary. Other amenities include an indoor pool and an exercise room. Amenities include a fitness room and free high-speed Internet for your comfort. A Full Bar open nightly from 5 PM to 9 PM with a light food menu. Daily we offer a free breakfast complete with biscuits and gravy, sausage, pancakes with build your own options and fresh fruits, a selection of pastries, cereal, yogurt, and 100% Arabica coffee or juices. Amenities include a complete fitness room, complimentary full hot breakfast, Cocktail lounge, full bar with appetizers - Open for purchase daily 5 p.m. to 9 p.m. as well as on-site guest laundry facilities, free high-speed Internet and a friendly staff. A 1-mile drive to Mariah Hills Golf Course, this straightforward hotel is also 1.7 miles from the Dodge City Amtrak station and downtown Dodge City. All the low-key rooms include microwaves, mini-fridges and coffeemakers, as well as free Wi-Fi, pillow-top mattresses and flat-screen TVs with HD channels. Suites add sitting areas with sofa beds; some also feature whirlpool tubs. Kids 18 and under stay free with a parent or grandparent. A heated indoor pool with a hot tub and a fitness center are offered in addition to meeting facilities. Free continental breakfast and parking are provided. Stay Suites of America is only a 4-minute drive to Boot Hill Casino and United Wireless Arena. This beautiful hotel is also located just 1.4 miles from the Boot Hill Museum. All rooms are very spacious with flat-screen TVs, coffee makers, microwaves, refrigerators and Internet throughout the hotel. We offer a full hot breakfast buffet each morning in our breakfast area. We also provide a 24-hour service to our indoor heated pool/spa, exercise facility, business center and laundry facility.